Long-lasting and non-sticky with a fresh, citrus fragrance, incognito®'s Deodorant is the first alum crystal to be infused with an essential oil. Simply moisten before use; being lightweight, easy to use and compact, it is a travel essential. Unlike ordinary deodorants, which attract insects, this Deodorant contains rare Java citronella oil that significantly reduces your attractiveness to insects. For complete protection anywhere in the world, use in conjunction with incognito®'s Spray, Suncream and/or Roll On. Suitable for all the family, including babies from 3 months old. Finally, there is no GM, and we never test on animals! Ammonium alum, aqua (water), cymbopogon nardus (citronella) oil. Sustainably packed. Does not contain aluminium hydrochlorate. Deodorants marketed as crystal deodorants usually contain potassium alum or ammonium alum. These are natural crystals and stones that are better for the body than their potentially toxic aluminum counterparts (such as aluminium chlorohydrate which is used in many anti-perspirants). incognito® Deodorant contains a blend of natural products that help to mask kairomones. 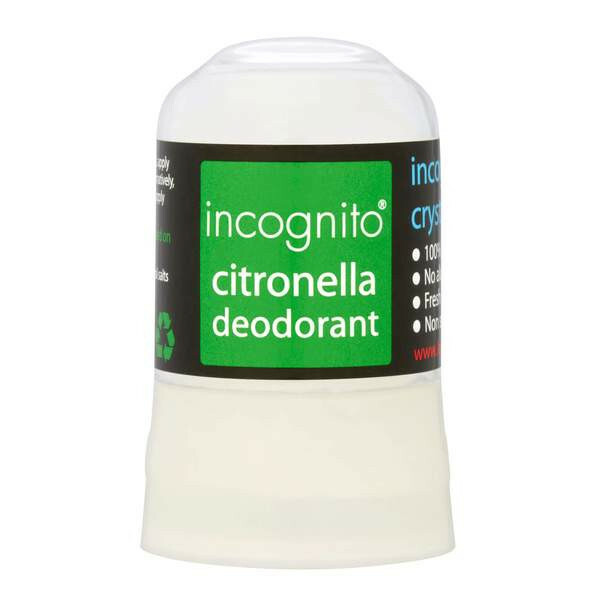 Scented cosmetics attract insects; in contrast the rare Java citronella oil found incognito®'s Deodorant helps to camouflage you and consequently, repels insects. incognito® Deodorant is certified as 100% natural. Many of the incognito® range of products are also certified COSMOS Natural. They are all completely free of any DEET, Parabens, GMO and SLS's. Our Deodorant is registered with the Vegan Society, meaning that at no point do we test on animals!